The Season Three trailer for the Showtime Original Series “Penny Dreadful” has begun making the rounds and since we have been watching it over at the Creative Command HQ, I wanted to be sure to post something for you to see it as well. You’ll need a subscription to Showtime to be able to check out the whole series and I think that there is a mobile device streaming service available as well which works like HBO Go. I don’t know too much about those services offhand so you will need to do some digging on your own time. Here’s the trailer. Penny Dreadful is a British–American horror drama television series created and written by John Logan, who serves as executive producer along with Sam Mendes and Pippa Harris. The title refers to the penny dreadfuls, a type of 19th-century cheap British fiction publication with lurid and sensational subject matter. The series draws upon many public-domain characters from 19th-century Irish and British fiction, including Dorian Gray from Oscar Wilde’s The Picture of Dorian Gray, Mina Harker and Abraham Van Helsing from Bram Stoker’s Dracula, Victor Frankenstein and his monster from Mary Shelley’s Frankenstein, and Dr. Henry Jekyll from Robert Louis Stevenson’s Strange Case of Dr Jekyll and Mr Hyde. (thanks Wiki). 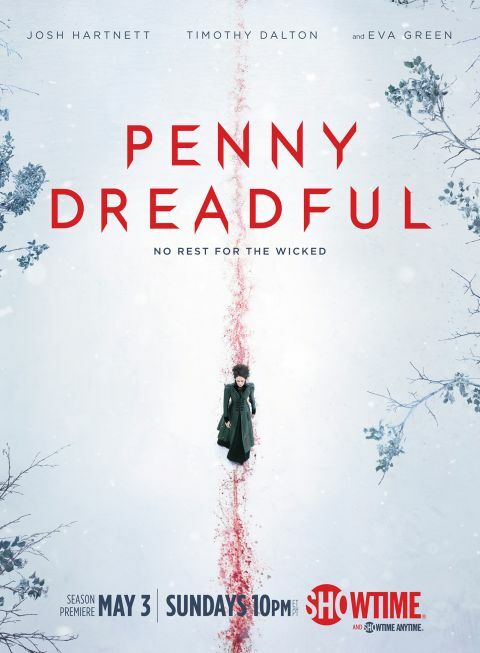 If you’ve seen the first season of this Showtime original series, then you are likely just as excited as I am about the return of “Penny Dreadful” which begins its second season tonight. Premise: Penny Dreadful is a British-American psychosexual horror television series created and written by John Logan, who serves as executive producer along with Sam Mendes and Pippa Harris. The title refers to the penny dreadfuls, a type of 19th-century cheap British fiction publication with lurid and sensational subject matter. The series draws upon many public domain characters from 19th-century Irish and British fiction, including Dorian Gray from Oscar Wilde’s The Picture of Dorian Gray, Mina Harker and Abraham Van Helsing from Bram Stoker’s Dracula, and Victor Frankenstein and his monster from Mary Shelley’s Frankenstein. The series premiered on Showtime on May 11, 2014.